Saxophonist Kazemde George will lead a "jam session" at the Parkside restaurant at 705 Flatbush Ave. as part of the PLG Music Festival held May 15 through 21. PROSPECT-LEFFERTS GARDENS — Get ready for a very musical week in the neighborhood. Starting Monday, May 15, live music will fill nine Prospect-Lefferts Gardens venues for the first ever PLG Musical Festival, organizers said. The weeklong event put on by the local arts group PLG Arts features dozens of city artists, many from Brooklyn, who will bring a diverse slate of genres to the area, from chamber music to Latin jazz to Big Band. The festival kicks off May 15 with a jazz performance curated by trumpeter Jake Henry at 65 Fen and continues with at least one performance each day, ending with two performances on Sunday, May 21: one with children’s performer Miss Nina at the Greenlight Bookstore on Flatbush Avenue and another with string quartet The Rhythm Method at The Owl Music Parlor on Rogers Avenue. All events at the festival are free with the exception of a performance by the Switzerland-based Trio Elgar, who will play at Soup & Sound on May 17. Admission to the event is $20 per person. ► Trumpeter Jake Henry curates a live jazz performance. 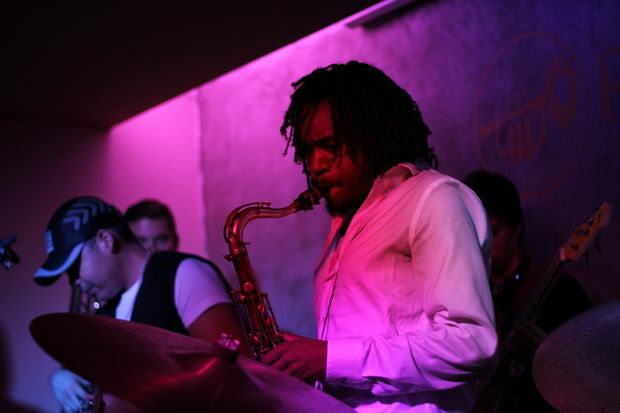 Where: 65 Fen, 65 Fenimore St.
►Saxophonist Kazemde George leads a “jam session” with the house band until midnight. When: 9 p.m. to 12 a.m.
Where: Parkside Pizza, 705 Flatbush Ave.
► The Aaron Burnett Quartet plays modern jazz. Where: Westbury Inn, 673 Flatbush Ave.
► The Zurich-based jazz and rock group Trio Elgar plays a concert. Admission is $20. Where: Soup & Sound, 292 Lefferts Ave.
Where: KD’s Bar and Lounge, 408 Rogers Ave.
► Singer-songwriter and guitarist Camila Meza performs her global jazz from 8 to 9 p.m. Caroline Davis’s trio “Alula” performs from 9 to 10 p.m.
► Flutists Anne Dearth and Nic Handahl performs works new and old and improvised pieces at this live music brunch. Where: Desserts by Michael Allen, 1149 Nostrand Ave.
► The Rachel Therrien Latin Jazz Quartet will play an open-air concert. ► The Liberté Big Band will play compositions by Canadian composer Liberte-Anne Lymberiou. ► Children’s performer Miss Nina will lead an interactive music workshop for kids. Where: Greenlight Bookstore, 632 Flatbush Ave.
► The contemporary string quartet Rhythm Method will perform. There is a $10 suggested donation. Where: The Owl Music Parlor, 497 Rogers Ave.